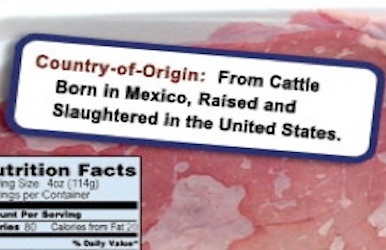 Did you know that while meat in the US has been labeled with the country of origin, it now includes far more details like where the animal was born, raised, and slaughtered? The move is hailed by meat consumers who want to know what they are sinking their teeth into. Unsurprisingly, the meat industry opposed the measure. The Country of Origin Labeling rule went into effect in May of 2013, with companies given 6 months to clear out their current stock “to clear the chain of commerce, thus preventing retailer and supplier confusion and alleviating some of the economic burden on regulated entities,” as U.S. Department of Agriculture puts it. As of late November of 2013, consumers have more information with which to make purchasing decisions. If you prefer local meats, and you should, you can buy knowing where the lifecycle of your meat occurred. Several giants in the agribusiness world opposed the measure, and understandably so. Cargill, Tyson, and the National Cattlemen’s Beef Association said it was costly and “short-sighted”, worrying it could ultimately cut into their profits.Tyson in particular is being pressured by activists to make more room for their animals in order to avoid animal cruelty heat. Consumers want products that didn’t have to travel across the globe to reach them—particularly when it comes to something perishable like meat. These large corporations are more likely to be bringing in meat or animals from other countries. Small farmers, on the other hand, are raising their own and are far less likely to be opposed to such transparency. The USDA estimates the meat industry will have to spend anywhere between $53 million and $192 million to come into compliance. A large portion of the costs will be directed towards stopping cattle and ultimately beef from intermingling with those from other countries so that they can be properly labeled. For many, this will require new infrastructure. The US meat industry needs more transparency, and this is a good first step. Perhaps we can hope that one day labels will announce which products come from “concentrated animal feeding operations (CAFOs), like feedlots. These account for an estimated 95% of dairy, meat, and eggs sold in the country. Transparency is the first step towards positive change in the meat industry. Small victories like the latest in meat labeling should be celebrated as they are laying the foundation for major advancements.